Emma is all pink and sweet perfection. 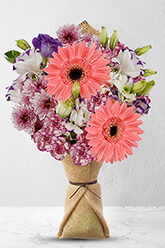 This is a perfect mix of delicate trophy flowers like Gerberas and Eustomas, plus the enchanting aroma of fresh Carnations. It is sure to bring the joy of Spring to your recipient and any room it is placed in.Vase is not included however, for a bigger impression we recommend a Standard Vase, which is an ideal enhancement to Emma. Helpful and responsive. My mom loved the flowers!